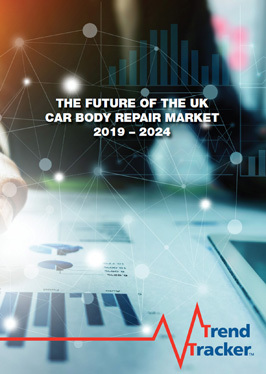 A comprehensive report on the UK Car Body Repair Market, published today by independent research company Trend Tracker, warns that a continued decline in repair capacity will lead to increased repair costs over the next five years. The number of UK accident repair centres (car bodyshops) has fallen by 20% over the last decade from 3,950 in 2008 to 3,162 in 2018, and Trend Tracker predicts a further decline over the next five years. “With the number of bodyshops continuing to decline, it appears imperative that insurance companies and claims solutions providers adopt a strategy to truly work with their supply chain to secure repair capacity over the forthcoming years. The cost of parts alone on insurance-related repairs has risen by 40% in the past five year period, which presents a concern for motor insurers. New technologies in vehicle design, including Advanced Driver-Assistance Systems (ADAS), have had a bearing on driving up repair costs. A vehicle’s integral adaptive features, such as automate lighting, adaptive cruise control, lane departure warning systems, automatic lane centring, and so on, require technical repairs to be completed by highly competent staff and to be calibrated following an accident. This also presents bodyshops with a challenge due to a skills shortage, which only adds pressure onto labour costs. “This is why it’s critical for insurers to work with their body repair partners as it’s in everybody’s interest for bodyshops to attract and retain high calibre staff, ensuring that an insurer’s customer gets a safe repair,” Bull concludes. The ‘market study’ report can be purchased for £1,495 by clicking here.